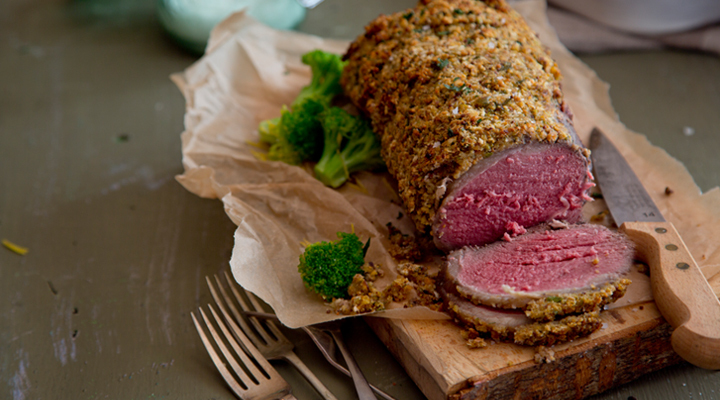 Pistachio and breadcrumbs make a lovely, crunchy crust for this special beef dish. Walnuts or hazelnuts would make a nice alternative. In a small blender, blitz together the pistachios, breadcrumbs and parsley until coarsely chopped. Add the egg, mustard, olive oil and a little salt and pepper and stir until well combined. Spoon the pistachio breadcrumbs over the top of the sirloin, pressing it firmly onto the beef to ensure not too much will fall off. Set aside. To make the dauphinoise potatoes, layer the potatoes with some garlic and seasoning in the base of a gratin dish. Sprinkle the cheese between the different layers, if using. Pour the cream and milk over the potatoes until they are almost covered, then season again. Cover with a piece of parchment paper, then a sheet of tin foil. Set aside for the moment. Place the beef in the preheated oven for 15 minutes, then reduce the oven temperature to 180oC/gas mark 4 and continue roasting for another 50 to 60 minutes for medium (or until cooked to your liking). Add the potato gratin at this time too, as the potatoes will take about 1 hour to cook. Meanwhile, blanch the broccoli in boiling salted water for 3 minutes, until al dente, then refresh under cold running water, drain and leave to dry. When the beef is ready, heat a large non-stick pan or griddle pan with the oil and griddle the broccoli florets for 2 to 3 minutes, until coloured. Remove from the heat and season with lemon zest and juice and salt and pepper. Transfer the beef to a serving platter and leave to rest for a few minutes. Carve and serve with the broccoli and dauphinoise potato. If you're watching your fat intake, choose low-fat milk, cream and cheese.